GEA is a complete solution for the measurement and analysis of vibrations in civil and construction field. It is a unique system that can help you managing a wide variety of application needs, from simple measurements of single location to the development of complex monitoring networks for many monitoring points. Within the low-noise tri-axial sensor, SEQUOIA IT integrates the power supply, the conditioning and signal 24-bit digitalization. There is no more need for DAQ boards for connecting the sensor. 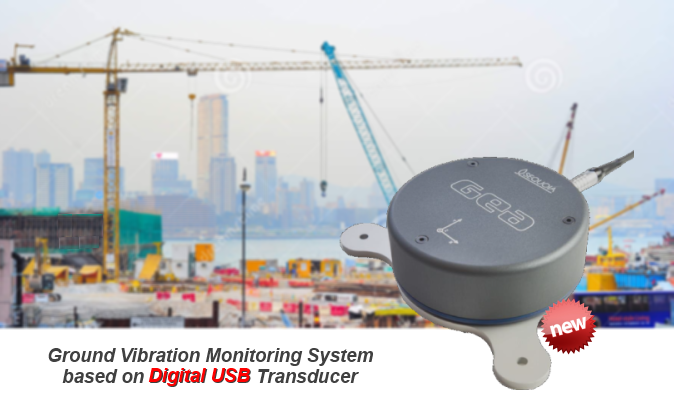 You can simply connect the GEA to the PC through a normal USB port, or as an option via WiFi, and thanks to the GEA-Lab Software, you get a powerful tool for measuring and analyzing vibrations in buildings and civil structures. GEA guarantees the highest modularity allowing an easy extension of your instrument performances, from a simple single point measurement instrument to a multichannel system. No need for dedicated and proprietary Hardware or Software. Just add as much GEA as you like and connect them directly or via a USB HUB (HubSync) to the USB ports of your PC. For large structure or monitoring site, USB cable can be extended to 1 km using GEA USB HUB (HubSync). Each GEA unit is independent; therefore you have always to choose how to use it. Alone or together with other GEA, it gives you the highest flexibility in the usage of the system.